Plate 61. Ubi rupta rumpit. Franz Reinzer (1661-1708) was an Austrian Jesuit professor of rhetoric, philosophy, and theology. His Meteorologia philosophico-politica, in duodecim dissertationes per quaestiones meteorologicas & conclusiones politicas divisa, appositisque was first published in 1697. Meteorologia philosophico-politica is a meteorological, astrological, and political compendium. Subjects covered include comets, meteors, lightning, winds, fossils, metals, bodies of water, and subterranean treasures and secrets of the earth. Illustrations in the 1709 edition were done by Wolffgangus Josephus Kadoriza. Rare Book and Specials Collection, Library of Congress. NOTE: Ice which forms on moving water tends to be less uniform and stable than ice which forms on calm water. 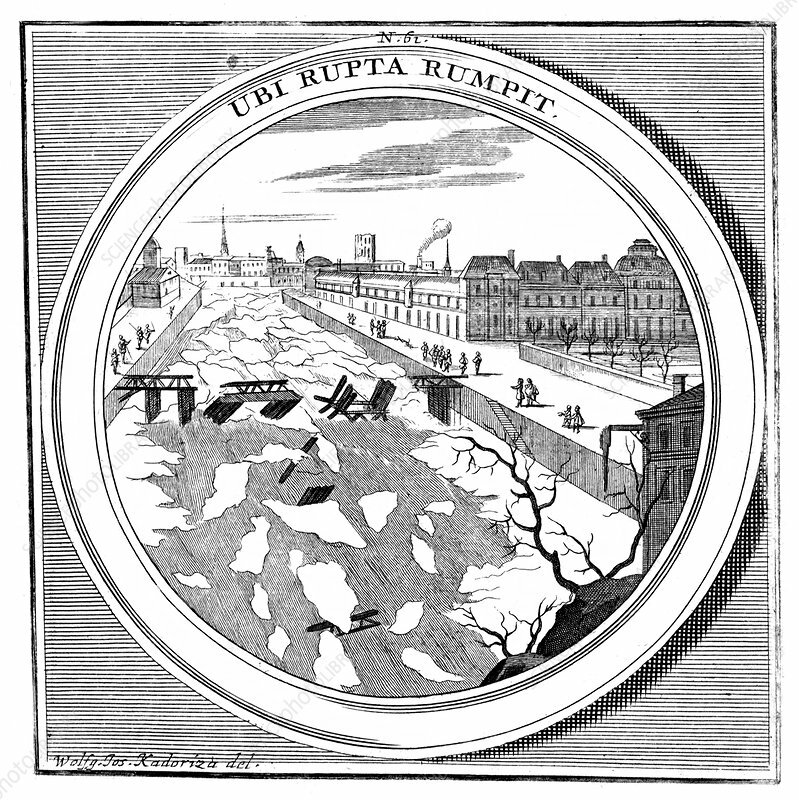 Ice jams, when broken chunks of ice pile up, are the greatest ice hazard on rivers. Ice jams can cause flooding, damage structures in or near the river, and damage vessels on the river.